MAKE and SAVE your company money! 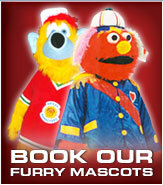 In February 2007, PROMASCOT expanded its services with "PROMASCOT MARKETING". specializes in ITEM PROMOTION. We work exclusively with many world-wide companies, enabling you to get great prices on a huge variety of products that other companies can't do for you. Simple: YOU NAME IT, WE PRINT IT! At ProMascotMarketing, we combine our strong local presence with a worldwide selection of promotional products and the strength of the Press-a-Print International Network of over 4,000 independent operators to provide you the best in customized marketing solutions. For much larger production requirements, we have direct access through the Press-a-Print Network to the industry's largest manufacturers. This unique synergy allows us to provide you with a world of promotional options and on-target marketing solutions that produce results. A thorough evaluation of your audience and marketing objectives, developing an effective theme and detailed plan of action, a search of our database to determine imprinted items that will best execute your plan, and over-seeing the success of your promotional plan from start to finish. Promotional products deliver lasting value and impact that conventional advertising just can't provide. Long after an advertising message disappears, promotional items imprinted with your logo or message offer a tangible reminder of your company. They are also far more cost-effective and accessible than conventional advertising. Whether you're a Fortune 500 company, a small business, or a nonprofit organization, imprinted promotional products offer an effective marketing solution that is appropriate for you! PLEASE VISIT OUR WEBSITE Error! Hyperlink reference not valid. where we have a virtual website. You can build your own virtual sample with your Logo, OR send us your company's Logo and we can do it for you absolutely FREE!